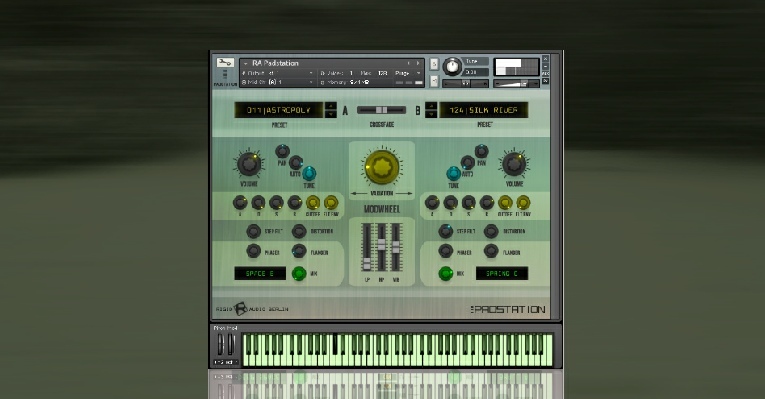 PADSTATION is a dual layer ROMpler with 2 x 200 outstanding and perfectly looped cinematic pad sounds. It features 200 hybrid synthesizer pads like strings, choirs, textures and sweeps. Each part features a convolution reverb with 60 impressive and nothing but "spacey" impulse responses, taken from Rigid Audio´s "AMBILOOP". To further shape the huge preset library, a centered variation knob can dial in 25 variations (presets) that alter the filter, the envelopes, LFO´s and effects of each part´s preset as well some hidden effects (Rotator, Lofi, Trancegate etc.). • 2.2 GB with 200 (multisampled) 16 Bit/44 KHZ pad sounds. • Built in part blending. • Variation knob for "random" part variations.